This is not the first time I use a furnishing fabric to make a piece of clothing. The baroque vest was the first attempt. I think the upholstery are heavier, richer and often less expensive than apparel fabrics. Aesthetically they are very beautiful, but not very comfortable. They are thick but not warm, heavy but not stretch. Resistent and beautiful, but cold and rigid. 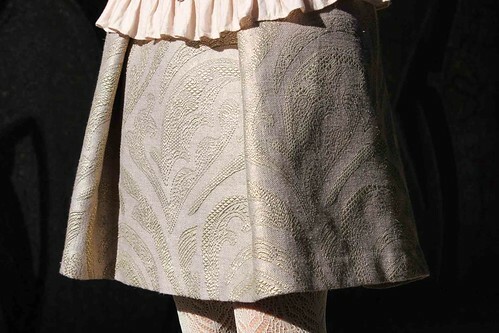 For the skirt I show you today I used a powder pink fabric with golden leaves. Instead of making curtains, I sewed a skirt with two pleats in the front and two in the back. Such a strong fabric is not easy to mix except with a navy velvet jacket or a cream teddy like in the pictures. And you, what are your experiences with furnishing fabrics?